I consumed Trader Joe’s chocolate cake for 4 servings last night with 28 grams of sugar which woke me up from 12 midnight to 3 am. Salt and protein has an effect on the brain to go back to sleep as described in this fruit fly study and one author’s regimen of combo of salt and sugar under the tongue. Caffeine in chocolate is negligible to have an effect but might have stronger effect on others. In the book Eat for Heat, researcher Matt Stone describes this trick we mentioned above as a solution to help you sleep better. Summary: Researchers investigate fruit fly brains to discover the connection between eating, sleep and activity. Source: Bowling Green State University. 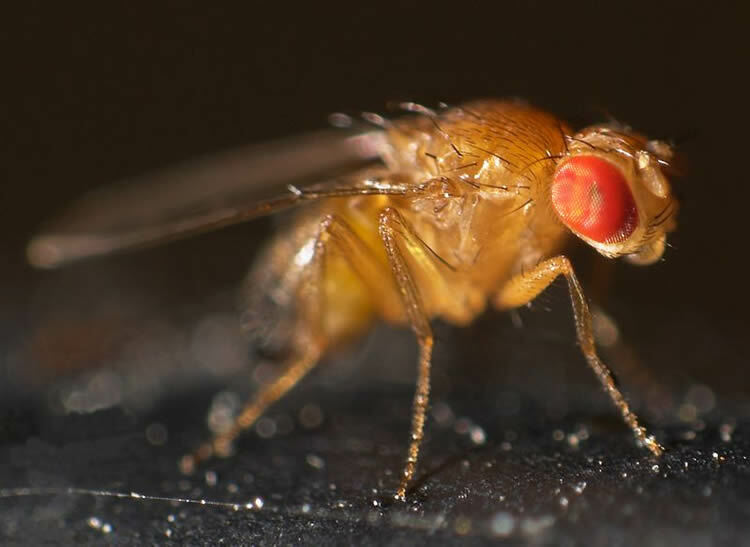 The humble fruit fly has proved to be a fruitful research subject for BGSU neuroscientist Dr. Robert Huber and colleagues from Scripps Research Institute in Florida and elsewhere. The collaborators’ research into their behavior has helped expand our understanding of some important neurobiological connections between eating and sleep — including the infamous “food coma” felt after a big meal. The Scripps study was one of Huber’s projects as a fellow at the Radcliffe Institute for Advanced Studies at Harvard University in Cambridge, Mass., last year. As an expert in computational ethology, he uses computer technology to obtain meaningful numbers from complex systems — in this case, capturing and precisely recording the tiny Drosophilas’ behavior related to eating, activity levels and sleep. The cause of the food coma turned out to be protein and salt, along with the time of day the food was consumed. Surprisingly, sugar did not seem to play a role, according to the study. The results of the experiments Huber conducted with lead researcher Dr. William Ja of Scripps and his team were reported in more than 200 newspapers around the world. The scientists will now look more deeply at the brain structures that induce the insects to sleep after consuming protein and salt, and test theories about why sleep then would be beneficial. “Clearly, protein is a very expensive commodity,” Huber said. “If sleep increases your ability to resorb it, that would be a possible reason. And the same thing with salt.” Carbohydrates, on the other hand, are much easier to come by in nature, he said, so might not call for such dedicated digestion. The fruit flies’ preference for protein does explain their attraction to overripe fruit, where they can lay their eggs. “The flies have very good sensory receptors to detect all kinds of volatile compounds that indicate ripe fruit and yeast,” Huber said. Huber’s interest in computer ethology is tied to his fascination with the connection between genetics and behavior, first discovered and explored by the late molecular biologist Seymour Benzer, with whom Ja conducted postdoctoral research. Huber has also been working with other labs on projects utilizing video tracking and had an article in the journal PLoS One in 2012 about developing better technology to look at the activity patterns of fruit flies. His primary projects as a Radcliffe fellow are with Dr. Ed Kravitz of Harvard Medical School, examining addiction and aggression in Drosophila. A shared interest in behavioral genetics is what also drew Huber to the Ja team’s work. “Ja has always been interested in the connection between behavior and genetics,” Huber said. “And their lab is just phenomenal. The real advantage of the fruit flies is you have such exquisite control over all the different bits of their genes and there’s so much you can do with them. Thus, a system devised by Huber senses when a fruit fly alights on a tiny platform and reaches up to eat from a tube. The computer measures exactly the number and duration of instances of feeding along with a record of the fly’s activity levels, including those that denote sleep. During the food coma, the flies remain still for a certain amount of time and they are much less responsive to any kind of other cues than they would normally be, he said. “There’s clearly something very potent about sleep itself,” Huber said. Using genetic manipulation techniques, the team will look at whether a neuron with a receptor for a neuropeptide called leucokinin is actually playing a role in causing the flies to fall asleep specifically after consuming protein and salt. “You can turn those receptors on and off with molecular genetics and piece together how the whole network that controls sleep is put together,” Huber said. This should help reveal more about the mechanics of sleeping and eating. Using a tiny but extremely powerful LED light, he is able to trigger responses in the genetically modified flies. When the light is not activated, the insects behave just like any other normal fruit fly. After spending several months observing the fruit flies up close, Huber said he has a new appreciation for them. “They’re very intricate little ‘critters,’” he said. “I spent quite a few days at first just watching them, and their behavior is a lot more complex than what we might think. I did not appreciate them before going there. “Flies are very good at learning,” he added. Additional research into those individuals who are not good at it has identified which genes are altered in these “behavioral mutants.” In collaboration with BGSU colleagues Drs. Moira van Staaden, biological sciences, and Jon Sprague, director of the Ohio Attorney General’s Center for the Future of Forensic Science, he plans to study the role these genes play as flies learn sensory cues paired with human drugs of abuse. The fruit flies have inspired not only scientific but also art projects. Huber is collaborating on a “fruit fly soundscape” that arose from his new friendship with Radcliffe fellow Reiko Yamada. A sound artist, classical pianist, experimental composer and now artist in residence at the Institute for Electronic and Acoustic Music at the University of Music and Performing Arts in Graz, Austria, Yamada was “really mesmerized by the difference in scale we live in between the fruit flies and humans,” Huber said. Their interactive soundscape will debut at the IEM Cube at the end of March. In addition, Huber is collaborating with his former adviser Dr. Kent Rylander, now turned jazz musician since his retirement from Texas Tech University 15 years ago. Huber and Rylander are pursuing a project on the aesthetics, compositional patterns and improvisation of birdsong. Image Source: NeuroscienceNews.com image is credited to Mr.checker and is licensed CC BY SA 3.0. Bowling Green State University “Blame ‘Food Coma’ On The Brain.” NeuroscienceNews. NeuroscienceNews, 9 January 2017. Food consumption is thought to induce sleepiness. However, little is known about how postprandial sleep is regulated. Here, we simultaneously measured sleep and food intake of individual flies and found a transient rise in sleep following meals. Depending on the amount consumed, the effect ranged from slightly arousing to strongly sleep inducing. Postprandial sleep was positively correlated with ingested volume, protein, and salt—but not sucrose—revealing meal property-specific regulation. Silencing of leucokinin receptor (Lkr) neurons specifically reduced sleep induced by protein consumption. Thermogenetic stimulation of leucokinin (Lk) neurons decreased whereas Lk downregulation by RNAi increased postprandial sleep, suggestive of an inhibitory connection in the Lk-Lkr circuit. We further identified a subset of non-leucokininergic cells proximal to Lkr neurons that rhythmically increased postprandial sleep when silenced, suggesting that these cells are cyclically gated inhibitory inputs to Lkr neurons. Together, these findings reveal the dynamic nature of postprandial sleep.